Joe Biden is fine. Bernie Sanders is fine. If humans lived until the age of 145, either one of these white men might appear a promising option for a 2020 bid. But they’re old—too old, scientists might say. 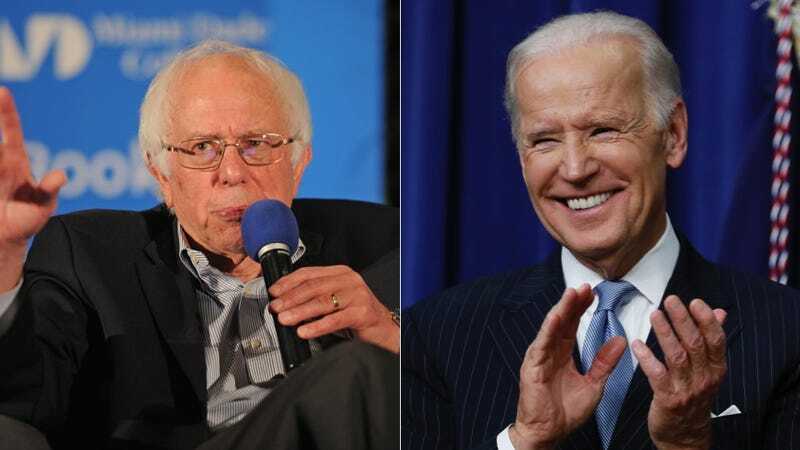 A Public Policy Polling survey released on Tuesday found that Democrats favored outgoing Vice President Joe Biden, age 74, followed by Vermont Sen. Bernie Sanders, age 75, as the 2020 Democratic nominee. Both would be pushing 80 on the day of their hypothetical inauguration. That’s pretty old for someone to be flying around the world all the time and dealing with national security issues in the middle of the night and sweeping up the shattered remains of our post-Trump democracy. Personally, when I am 80, I intend to be either fully dead or taking a watercolor painting class. Third runner-up was Sen. Elizabeth Warren, who will be a slightly more reasonable 71 in 2020. But unless that asteroid puts us out of our misery soon, Donald Trump, at age 70, will be the oldest elected president of the United States; it will be difficult to separate any age-related cognitive issues from all of the other stuff that’s clearly wrong with his brain, but research does show, via Politico, an age-related decline in “fluid intelligence,” meaning the ability to learn, reason, and solve unfamiliar problems. It’s worth noting that this poll is just a poll, and doesn’t really mean anything—New York Governor Andrew Cuomo was included as an option, for example. That’s funny! A lot can change in four years, and while the Democratic bench is pretty desperately empty right now, the rules have suddenly shifted: literally anyone can run for president now. State Senators! Mayors! Samantha Power! Wendy Davis! Viola Davis! Me! But, you know, this is a shirt that people are buying, and Joe Biden keeps winking at us, and so it is time to say: Nah. These beloved grandfather figures are not going to save us. For the next four years, we’re going to need to figure out how to save ourselves.